Leave some love at each stop on the hop because some random commenters are going to WIN some $$ to the krafty shop! 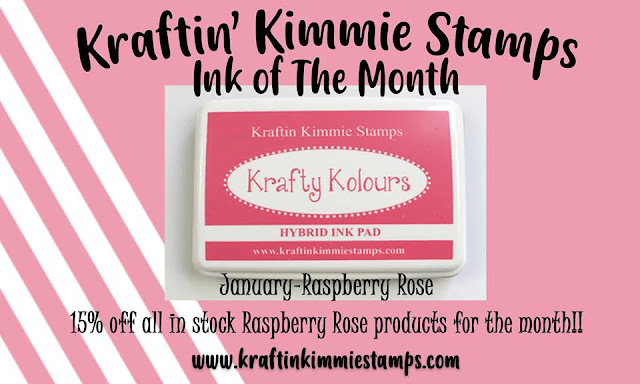 Welcome back to Day THREE of our January Krafty Peeks at Kraftin' Kimmie Stamps! 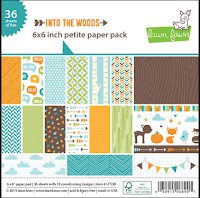 Today we are sharing a wonderful stamp set by Emilie Goulet! It's called YOU COMPLETE ME! This set shows that there are all kinds of love in the world! 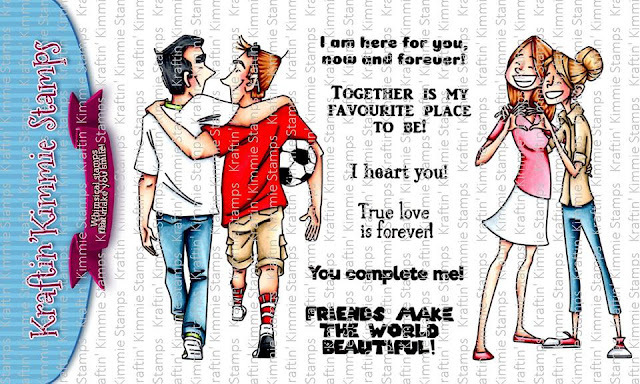 Love between couples, love between partners, love for friends and family! And it's not just for Valentine's Day...we should be showing our love for each other every day!! The set features two main images and six coordinating sentiments! I'd also like to announce something NEW that we are doing this year! It's called INK OF THE MONTH! Be sure to scoop up the large ink pad and ink refill right now! You'll get to see ALL of our new goodies...stamps, stencils, ink and DOTS in action over the next couple of days in the January Krafty Peeks and they'll all be released at our LIVE Online Release Party on Saturday, January 12 at 2pm EST in the Krafty Friends group! 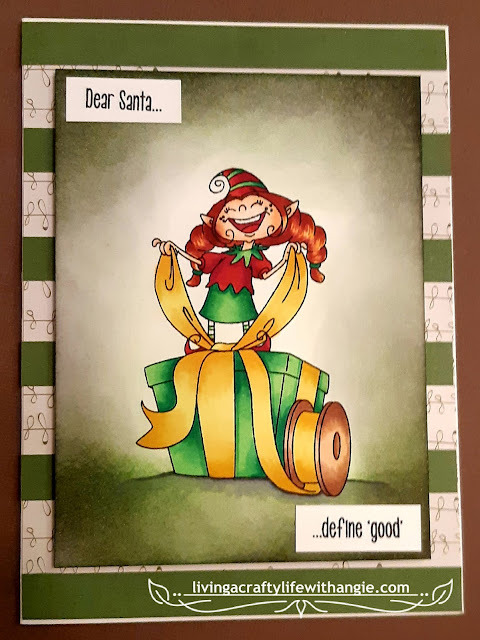 This is the 1st of 2 cards I've made using this stampset.. check back on day 5 to see my other creation. This card was a lot of fun. 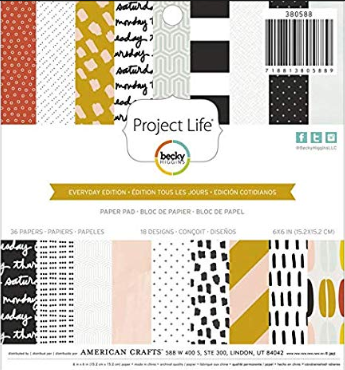 I had a concept in my head and had to search through a lot of paper pads to find just the right papers. I hope you like it as much as I do. I started the card using a base of trees which I found in Lawn Fawn's Into the Woods 6x6 paper pad. The orange frame was created using the Elizabeth Craft Designs Die set called Dashing Rectangles. Although difficult to see in the photos there are tiny cut out dashes around the die cuts. 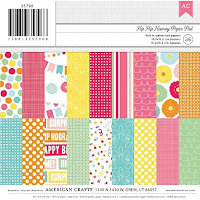 This Border and one sun was cut out using patterned paper by American Crafts - Hip Hip Hooray! 6x6 paper pad. 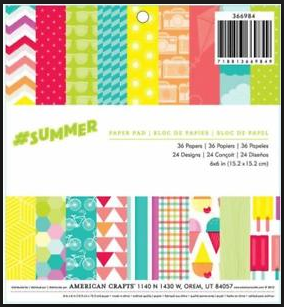 I was able to find clouds paper in the #Summer 6x6 paper pad by American Crafts. This piece was cut using the larger Dashing Rectangles Die to match perfectly. 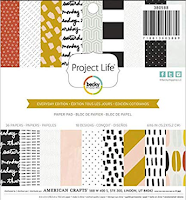 In this same pad I found the yellow paper I used to create the other sun die cut that I used as the top layer. 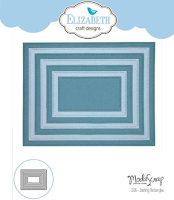 The clouds were creating using a die I found in my stash and patterned white paper I found in American Crafts - Project Life - Becky Higgins - Everyday Edition. I used foam to create dimension. I created the layered grass using 2 different green patterned papers and the Taylored Expression die called Wipsy Grass Border Die. The 1st grass border was cut from green patterned paper in the #Summer 6x6 Paper pad mentioned above. 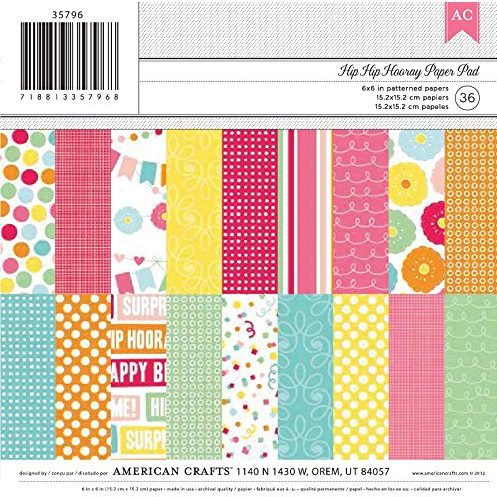 The other was from the My Favorite Things - Calm & Cozy Chevrons paper pad I used from the above 1st card. I cut 2 of each and layered the pair twice adding one directly to the card base and the other on top of the frame to create dimension and leave room for the men to be secured. To Finish off the card I added more of Kraftin' Kimmie's aweosme new dots. Be sure to hop around and check out some samples from our incredible Krafty Team featuring YOU COMPLETE ME! And leave some love at each stop on the hop because some random commenters are going to WIN some $$ to the krafty shop! Love it. Makes me think of special father- son moments in our family’s lives. Proud of our son playing his best, win or lose. Love this card. It would be a perfect Father's Day card! Love the card, thanks for adding how you did it! Great card Angie! Love the little sun & clouds die cuts..really pulls the card together!! Great coloring on these guys!! Such a happy and Sunny card! Love the dies from DP!! OMG! THIS SCENE is too cute! Love this card! The dimensions are amazing! Love all the added detail to this card!